The creation of a flexible, efficient, digitized, dependable and resilient power grid may well be the best route to increasing energy efficiency & security, as well as boosting the potential of renewable & distributed power sources. 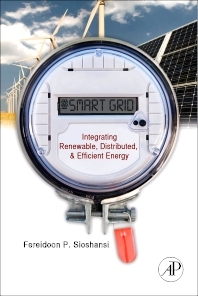 This book covers smart grids from A-Z, providing a complete treatment of the topic, covering both policy and technology, explaining the most recent innovations supporting its development, and clarifying how the smart grid can support the integration of renewable energy resources. Among the most important topics included are smart metering, renewable energy storage, plug-in hybrids, flexible demand response, strategies for offsetting intermittency issues, micro-grids for off-grid communities, and specific in-depth coverage of wind and solar power integration. The content draws lessons from an international panel of contributors, whose diverse experiences implementing smart grids will help to provide templates for success. Where do customers fit into the smart grid puzzle? Customer view of smart grid – Set and forget? Patti Harper-Slaboszewicz, CSC Company, Todd McGregor and Steve Sunderhauf, Pepco Holdings Inc.